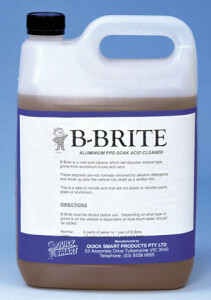 B-Brite Aluminium Truck and Mag Wheel Cleaner is a concentrated mild base acid cleaner which will dissolve mineral type grime deposits from aluminium trucks, vans and mag wheels. These deposits are not normally removed by alkaline detergents and show up after the vehicle has dried as a whitish film. This is a safe to handle acid that will not attack or discolour paint, glass or aluminium.